While some people enjoy making a fashion statement with eyeglasses, others prefer their appearance without them. Contact lenses can achieve this without irreversible refractive surgery. Today’s contact lenses are more healthful, fun, and convenient than ever. Contact lenses can also provide a full field of unobstructed vision, which is great for your active Wyoming lifestyle. If you were told in the past that you couldn’t wear contact lenses, odds are that’s not true today. There are more convenient and healthy contact lens options than even a few years ago. At Frontier Eye Care, we fit contact lenses of all types – soft contact lenses, astigmatism-correcting contacts, bifocal contacts, rigid gas permeable lenses, continuous-wear (overnight) contacts, daily disposables, and more. A no-risk consultation is included in your eye exam. Just ask Dr. Hodgson. 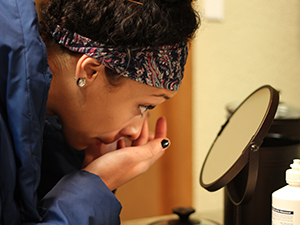 To schedule a contact lens fitting, call our Casper office at (307) 472-2020. So find out what our patients and customers think of us! Check out our Reviews Page for endorsements, recommendations, and folks just sayin' nice stuff! Our friendly staff will find an appointment time that works best for you! If you'd like, you can download the forms below prior to your visit. 'Like' Frontier Eye Care on Facebook for more photos, patient recommendations, and eyecare tips!